As time passes, our understanding of the scale and importance of the UK’s coal industry fades. In the 1950s and 60s, most homes had coal fires, and electricity and gas were both produced from coal. In our grandparents’ childhood, more than a million men were directly employed in the industry world’s railway and UK coal powered most of the world’s shipping fleets as well as our own massive industrial base. This country’s coal reserves were a major factor in our leadership in the industrial and commercial spheres and it can be said that Britain’s success was ‘built on coal.’ The success of the coal industry also bought a high toll of deaths and injury, dangerous levels of atmospheric pollution and acute industrial unrest. In 2015 the UK’s last deep coal mines closed and the country’s residual requirements for coal will be met by imports from places such as Poland, Columbia and China. For those of us born in the 1950s, the South Wales valleys conjure up images of colliery headgear, spoil heaps and coal trains. In reality however this is an anachronism and few such features survive in the modern valleys. The surface structures have been swept away and the underground workings are flooded and collapsed. In many ways much of South Wales really was ‘built on coal’ and the photographs in this book record most aspects of the valley pits. The images are, with few exceptions, ‘historic’ for all traces of the past which they record have gone. In many ways these images are a celebration of a way of life that, for better or worse, has now passed. I hope you enjoy seeing them as much as I enjoyed taking them. A unique pictorial record of the fast few years of coal mining in the eastern valleys of South Wales with over 350 images of large and small colleries across the district. Choice of photographs was made of the basis of their breadth of coverage and well historic and aesthetic merit. 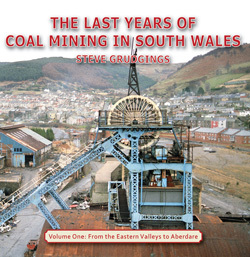 An outsider to both South Wales and to Coal Mining, Steve Grudgings has had great pleasure becoming familiar with both over the past 40 years, some of the results of which fill these pages. Increasingly active in researching, conserving and documenting the remains of the UK’s coal industry now there are no active pits left to photograph, he has become something of an ‘accidental expert’ on many facets of an industry that has nearly vanished from this country.